Power grid, the Central Transmission Utility (CTU) of Indian and a Nirvana Public Sector Enterprise under the Ministry of Power, Govt of India operates around 1,42999 circuit kms of transmission line along with 226 Sub-stations(as on 30.09.2017) and wheels about 50% of total power generated in the country through its transmission, network POWERGRID, with its strong in house expertise in various facets of Transmission, sub –Transmission, Distribution and Telecom Sector also officer consultancy services at National and International level. 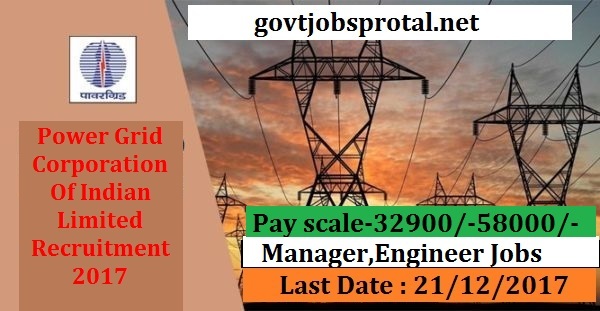 Candidates presently working as field engineers and completed 1 year in Power grid or those earlier worked as FE/AE (FTB) in POWERGRID for the at least 01 year are allowed relaxation in upper age limit and equivalent pay for the Post ID 162. Application should have sound heath. NO relaxation in health standard is allowed. For Norma’s and Standards of Medical Fitness please visit HEALTH link on Career page of our website. Interested application must log on www.powergridindia.com for detailed advertisement. Candidates other than SC/ST/PWD and EX-SM are required submit Application free of Rs.500/- through online mode –payment with Net Banking, Debit card,credit card through payment gateway link in their Candidates Login at POWERGRID website. The detailed guidelines for submission application are available at www.powergridindia.com Mentioned above.